The 34th Havana International Trade Fair is officially inaugurated, where the presence of 73 countries and over 3500 exhibitors set new records. 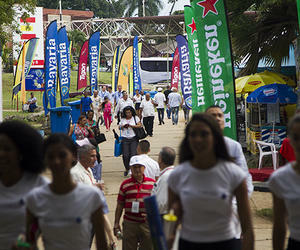 Cuban Foreign Trade and Investment Minister Rodrigo Malmierca said these figures show the growing interest of entrepreneurs from all over the world on the potential the Cuban market has, and the Fair has become a reference point for those willing to do business in Cuba. He added the growth comes as well from the new opportunities Cuba offers as well as the international rejection to the over 50 years long US embargo on Cuba. Malmierca pointed out that this event is part of Cuba´s strategy to diversify trade relations throughout the world, in order to avoid dependence on one single market. Despite financial limitations, caused by growing prices in the international markets and difficulties some of the Cuban largest trade partners are facing, the Caribbean nation intend to honor its commitments, he said. The Cuban Minister said Spain remains the country with the biggest representation, followed by Venezuela, China and Russia, with a significant increase on the amount of exhibitors from France, Italy and Japan. The Fair will run through November 5th and will include bilateral meetings, forums, signing of agreements and several activities, all aiming at boosting Cuban development.